The Greats: A return to investment-worthy classics and the iconic heritage of famous designers. Wild Thing: All sorts of animal prints add visual interest to neutrals. Knit Picking: Knit pieces in different fabrications, gauges, textures, and patterns will keep you cozy this fall. Marching Orders: Military-inspired detailing and colour continue to be huge. Crimson All Over: Whether it's poppy, tomato, or scarlet, red in all its iterations will be the 'it' colour of the season. Proportions: For women, fall 2010 marks a return to modesty with elongated hemlines and fit-and-flare silhouettes (hello, ladylike dressing!). For men, cropped jackets and lots of versatile layering pieces are perfect for experimenting with and creating a cozy interesting look. Colours And Fabrications: Camel is "the new colour of luxury" and the colour for fall (aside from red, of course). Sooty darks and harvest/autumn-inspired colours return as perennial favourites, as do British fabrications such as tweeds, checks, and flannel. Prints--animal, floral, paisley, stripes--continue to be popular. The key words this season, she noted, would be authenticity, comfort, ease, intelligence, and classics. "Authenticity [today] will be tomorrow's heirlooms." 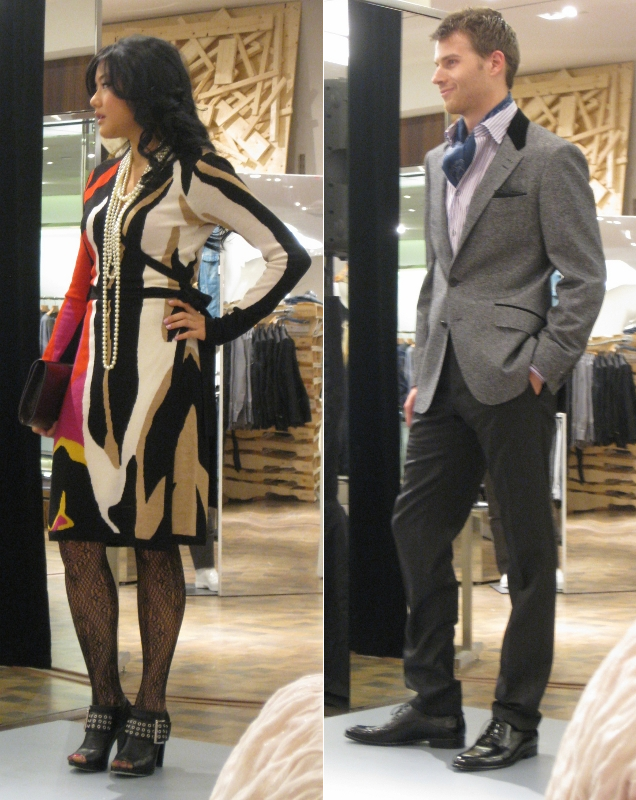 A fashion show styled and modelled by Holts staff members followed, featuring beautifully put together looks. An expert panel was also present to comment on the clothing, accessories, and beauty looks. I didn't manage to get photos of everything, but here are a few of my favourite looks from the show. Outerwear and cozy knits for fall. The green military-inspired men's coat is by Burberry Prorsum. Red is the new 'it' colour for fall. I lovelovelove the look on the far right. With the beehive 'do, oversize sunglasses, and gorgeous Lady Dior handbag, this model could easily be a modern-day Holly Golightly. A bold DvF wrap dress and an Alexander McQueen scarf styled as a cravat keep things ladylike and gentlemanly, respectively. 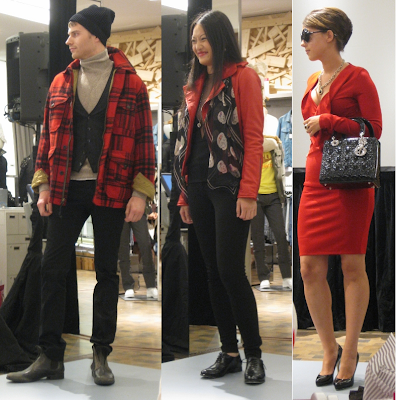 Thanks to Holt Renfrew for a great event! Oh wow, I just stumbled upon your blog, its so lovely and makes me miss Vancouver dearly. Its been three weeks since I left..and..sigh! This post is great, definitely looking forward to fall now. I am so excited about these trends! umm!!! i like to know what's happening in vancouver too..in terms of fashion...the styles remind me of the elegant english ones...ah...DVF is one of the mighty creators of the most beautiful dresses in the world...thanks for sharing! wow very Mad Men inspired - not surprising though given in economic downturns, don't we typically reach for the nostalgia of yesteryear? i started pickign up more red this spring so glad to see it continuing strong in the fall. i was thinking a more 70's swing coming too with the wide legged pant s- what do you think? Livie, I think you're spot-on with the 70s observation. I can't see any mention of a camel coat without thinking of Ali McGraw in Love Story. this is an amazing post. this is a very inspiring read. thanks for sharing! !